This is copied from something I composed for Annie and the The World Hoop Day organization to inspire others for Social Outreach with hoops. In 2007, I decided to travel to Haiti with a local organization, Family Health Ministries, to spend time with an orphanage. My plan was to carry lots of tubing and tape to make armloads of hoops for the kids there. When I wrote in my tribe blog about the trip, I received a tremendous amount of response and even encouragement to have a fundraiser for my adventure. Luckily, there was a community of people here who were moved enough by the idea that I received a lot of assistance and donations. We ended up hosting a pretty spectacular event for the entire community. The “Hoops for Haiti” event had 2 bands, a raffle, silent auction, hoop sales booth, extra hoops for guests to use and ended with a fire show. It was free to the public and well attended by folks of all ages. This is just one possibility for an event, but Hoopin’ Annie wanted me to outline my experience in hopes that it may provide some inspiration or assistance to those planning their own events. First, I must thank so many individuals that helped me out in a variety of ways. I have so much gratitude for individuals in the Hoop Path tribe (students in Baxter’s hoop class), the queen of the silent auction, Natalie; many other local hoopers and fire spinners; friends; my family; musicians; local businesses; artists; kids and all the folks who came out to play and support. If you are planning a World Hoop Day event, I propose recruiting volunteers so that tasks may be divided. If you are planning alone, take care to not overwhelm yourself. Plan something manageable so that folks, including you, can enjoy the festivities. There were so many folks from The Hoop Path tribe and other local hoop enthusiasts gathering tables, decorating them, working the raffle, silent auction, making announcements, inspiring, dancing and hooping. I didn’t even work a table but still had only brief moments to hoop during the event. Also in my favor was the undeniable impact hooping has had on this small community. Over the past 6 years, hooping has grown and evolved so tremendously here in the Carrboro/Chapel Hill area. Thus, local businesses and individuals who had experienced hoop joy or knew folks that hooping had touched were seemingly eager to donate gift certificates, artwork, money and time for this event. This plan (Hoops for Haiti model) is not meant to overwhelm. 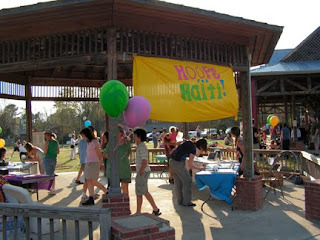 This was just one particular event that raised $2000 to get me and hoop supplies to Fondwa, Haiti. I was completely amazed that we raised double the original goal and were able to donate close to $1000 to a much needed food fund for the orphanage. While I was there, I lead a few days of playful instruction with the kids and helped them decorate hoops. We also painted the inside of the orphanage which really brightened the place. On my next visit, I hope to take more folks who are passionate about music, movement, hooping and experienced sustainable gardeners to work with a garden project that has been requested by those who run the orphanage. ---Here I have compiled some important aspects of the planning for the “Hoops for Haiti” event in case you are trying to organize a fund-raising event in your own town. 1) Set a goal: Imagine what you are trying to accomplish. Are you giving away hoops to everyone who comes? Are you trying to raise money to make hoops for a school or organization? How many hoops? Are you trying to raise enough money to send an ambassador to another location to distribute hoops? Or are you just trying to create an atmosphere where folks can really enjoy some hooping on this day or be introduced to hooping? Be clear with yourself what your goal is and how much money it will require. Then cater your event accordingly. 2) Space: Secure a space that will comfortably host your event. I checked out several spaces that would be cheap or free before I decided on the Town Commons in Carrboro. With its expansive, grassy, outdoor space, cheap price and great location, it proved to be a wonderful spot for a hoop gathering. If I had had more time to plan, I may have been able to get the space rental donated by the town. It’s worth inquiring. You may be able to get local support for a free location. Local parks and schools may be other possibilities for hosting an event. The only drawback of our spot was that there were no public bathrooms! There were ones in walking distance, but still an important factor to settle ahead of time. 3) Music: Some of my very dear friends are musicians and were willing to play for free for this event. We had two bands: one geared more towards the kids – danceable with positive lyrics, the Jimmy Magoo band - and one instrumental jazz/funk improvisational band. It was so great to see folks dancing with and without the hoops all day! Drum circles, DJs or interesting music compilations could inspire the crowd! 4) Admission: I did not charge admission, but made the event open to the public so anyone could enjoy the festivities. The space was pretty central so folks who were walking through town could hear the music and stop in if they wanted. If you have a space that has an obvious entrance point, you may be able to charge a small admission to raise funds for your hoop drive. It was important to me that the fundraising event served as a uniting celebration of the local community while raising money for me to travel to Haiti with hoops. I’m glad many folks enjoyed hooping for the first time and could immediately understand my desire to take the hoop joy abroad. 5) Raffle: One of the easiest parts of this fund-raiser was the Raffle. We included 2 dinner gift certificates (one donated by a previous employer of mine and one donated by a local hoop madre) worth enough that folks were willing to throw a few bucks in for the chance. Also, in the raffle were donated gift certificates for hair cuts, coffee and a deluxe handmade hoop. Raffle tickets were $3 for 1 or $5 for 2. I brought a BIG jar and paper with blanks for name, email address, phone number (so that they didn’t have to be present to win.) So many raffle tickets were sold it was difficult to fit them into the jar! Folks had to start writing their names and contact info on notebook paper. We announced the winners towards the end of the event. (I stocked up on change for this particular part.) If I were organizing an event with little assistance, this is one of the easiest things to do. You need a decent prize, someone to take money and a big vessel. If I couldn’t get a donation, but expected a decent turnout, I would consider buying a gift certificate to raffle. What we brought in would have covered the cost of both the dinners included plus a decent amount of hoop supplies. 6) Silent Auction: I was amazed at how many local healers, artists, businesses and community members donated items for the silent auction. There were massages, paintings, jewelry, energy work, yoga & hooping class passes, signed UNC basketball, ceramic dishes, private hoop lessons and more. I felt a little awkward soliciting and asking others to solicit donations. However, at the event, folks were coming to me asking if they could donate next time! I learned that it makes some people feel good to give to good causes. Plus, it does get their name out there to possibly get more business. It’s kind of a win-win situation. Natalie –a local hoop goddess - was the queen of the silent auction. Without her, I don’t know how it would have gone. She created beautiful sheets listing the item for bid, suggested retail amount, giver/artist and blanks for bids. She also wrote up a letter for donations including the mission of the event including the tax ID # of Family Health Ministries so that folks could solicit donations without having to say much. You could leave these requests with businesses or even send them out as in emails. In fact, I did receive both cash and donations for the silent auction through an email announcing the project. 7) Hoop Sales Booth: Two wonderful women (Natalie and Kathie) along with myself, made hoops to sale. One third of the proceeds went to the cause, while the other two thirds went towards materials and labor. This was the least effective part of the event, but it was good to have them available. It also reminded folks this is a handmade hoop revolution and that there are local crafters. 8) Donations: With a 501c3 tax ID #, folks can donate money and write these donations off on their taxes. Receipts are not required under $150. 9) Speaker/MC: This is one piece of the event that I would improve if I could repeat. Public speaking isn’t my strongest attribute, but I did explain why I was going to Haiti and why I thought it was important for me to take hoops. However, I neglected to inform folks about some key things. Oh well – a learning experience for all! 11) Publicity: Local radio stations, fliers, event calendars in local papers, personal email lists. I think the most effective publicizing for my event was through personal connections – the email chain! 12) Thank you poster: I made a large sign to post on an easel giving thanks to all the individuals and businesses who donated time, services, money to make the event a success. 13) Instruction: I didn’t have a formal instruction segment of the event, but think it is a valuable piece to add. There was so much going on that we left it more free form. I found myself giving some casual instruction to encourage the disbelievers that they could, in fact, hoop. It was really valuable that there are so many good local hoopers to inspire others to move try. 14) Hoops for Haiti posters: I work with kids so I had them paint a big sign that said “Hoops for Haiti,” and some smaller ones directing folks to “Raffle,” “Hoops for Sale,” “Silent Auction,” and “Welcome” tables. Much love, success and joy to everyone in the planning of their events. It’s going to be wonderful to see pictures and hear stories of lots of local events celebration the hoop movement!